A 9" Keyed-Assist GPS/Fishfinder with CHIRP Sonar, CHIRP ClearVu and CHIRP SIdeVu! 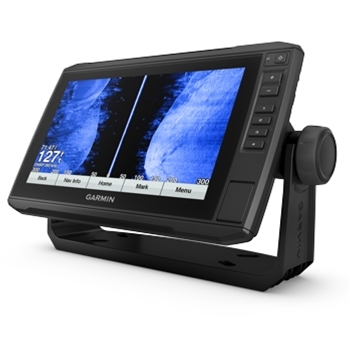 Garmin's echoMAP Plus with detailed g3 coastal charting, WiFi and QuickDraw capability is a must have for any coastal fisherman! Compatible with multiple 12-Pin transom mount transducers, this unit can provide depth and temperature readings and can reach depths of 1,100' with traditional CHIRP sonar while showing crisp clear near photo like images to depths of 500' and 500' left to right (*dependent on transducer selected). Added to that is the ability to use the optional transducer for QuickDraw Contours. With QuickDraw Contour mapping software built in, you’re instantly able to create personalized fishing maps with 1’ contours as you’re steering the boat across the waters. No special knowledge or software is required, simply fish and Garmin takes care of the rest. Maps will be instantly displayed and the best part is that these are your maps. Store up to 2 million acres of quickdraw contour maps - keep them for yourself or share within the Garmin QuickDraw community. It's totally up to you! Preloaded with Garmin BlueChart g3 Coastal Maps, the 94sv will provide detailed coastal charting with integrated Navionics data. Coverage includes the coastal US including east and west coasts, Gulf of Mexico and the US and Canadian side of the Great Lakes. Enjoy navigational aids, spot soundings, depth contours, tides, currents are more from the preloaded data! Built-In WiFi in the 94sv enables the user to sync your compatible Smartphone and your unit for text messages, emails and even phone calls right on your echoMAP Plus' display. Add to that the ability to access and update your charts, plan and save waypoints and routes between the app and your plotter, upload or download information to or from the Quickdraw community and even receive notifications and updates right from the app. It really cant get much simpler! Now enjoy sharing sonar and user data between two ECHOMAP Plus units (7x and 9x models only) via Ethernet cable with the February 2018 software update. The 94sv Plus is NMEA 2000 compatible for engine data, sensors, FUSION-LINK, autopilots and more making it quick and easy to establish a plug and play NMEA network. Want to make the most of your EchoMAP Plus? Add an optional Panoptix all-seeing sonar transducer to make the most of your sonar capabilities. See all around and below your boat in real time up to 100’ away or below your boat. with all these amazing features, the echoMAP Plus 94sv is hard to pass up. At an affordable price point, this 9" keyed-assist display is a must have for any fisherman! 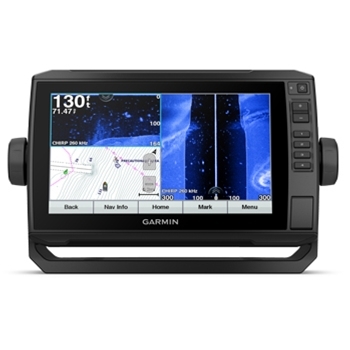 Garmin ECHOMAP Plus 94sv with BlueChart g3 for U.S.
Garmin's GT8HW-IF Transducer is designed for the Ice Fisherman and provides depth and temperature readings. Providing both Narrow and Wide Beam Options the GT8 High Wide provides crisp clear target separation and definition. Garmin GT15M-TM Transom Mount CHIRP Transducer is designed to be mounted on the transom (back) of your boat and create minimum drag through the water. This 600 Watt Transducer can reach maximum depths of up to 1900'. Garmin's GT21 8-Pin Thru-Hull Stainless Steel Transducer with Fairing Block provides Traditional 600W (50/200kHz) Sonar and 500W CHIRP ClearVu (CHIRP 260/455kHz)Designed for hull deadrise of 25 Degrees or less. Includes a Built-In Temperature Sensor. Garmin’s ECHOMAP Plus 74sv with detailed coastal charting offers crisp, clear underwater images when paired with the proper transducer. Built in CHIRP ClearVu and SideVu, this 7” Keyed-Assist touchscreen is a top choice in combination GPS/Fishfinders.